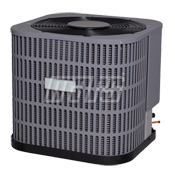 Residential A/C Condensers | Superior Supply Co. Most air conditioners either run at full power or are completely off, but the Comfort-Aire® RSG16 uses a better method to keep you cool. On moderate days, it can operate at a low, energy-efficient speed, then ramp up to a higher speed with increased cooling capability for hotter days. The Comfort-Aire® RSG14 is built with carefully selected components, like the heavy -duty scroll compressor, and is 100% factory-tested to ensure your air conditioner will last for years to come. The Comfort-Aire® RSG13 is built with carefully selected components, like the heavy-duty scroll compressor, and are 100% factory-tested to ensure your air conditioner will last for years to come. This split system cooling unit has been designed and built to provide many years of safe and dependable comfort, when properly installed and maintained. With regular maintenance, this unit will operate satisfactorily year after year. 13 SEER A/C Condensers charged with nitrogen which must be exhausted prior to charging with R-22. 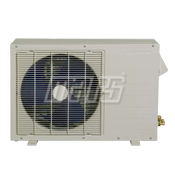 The RSN Series of split system condensers are the perfect replacement for outdoor condensing units of R-22 systems. They can be slab- or rootrop- mounted. 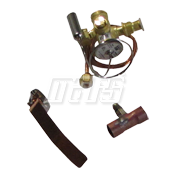 Shipped with a nitrogen holding charge, they are designed to be charged with R-22 in the field. Horizontal condenser is compact in size to fit in tight spaces without detracting from landscaping and outdoor living areas, which also makes it great for apartment complexes and condominiums.